Microsoft confirmed on November 8, 2018 that the option to set custom file associations is broken for some users on Windows 10 version 1803. The issue, first reported on November 5, 2018 by Chris Hoffman on How To Geek, prevents users and administrators from selecting custom file association defaults. Windows associates file types such as .txt, .pdf, or .jpg, with programs and opens files in the associated program when a user double-clicks on a file or right-clicks on a file and selects open from the context menu. All versions of Windows use sets of default file associations for compatibility and usability. Text documents open in Notepad by default and images in the Photos application. Users may change file associations so that files open in preferred programs instead. Text documents could be opened in Notepad++ instead or images in an image viewer that is faster than the Photos application. Windows 10 supports two main options to change file associations in the frontend. Associations can be changed under Settings > Apps > Default Apps, or with the help of the Open With > Always use this app menu when a file type without association is loaded. Administrators and users who attempt to change file associations in Windows 10 version 1803 — there are reports that some users experience this on Windows 10 version 1809 as well — may notice that the changed association does not stick. The program that you want to change the association to may be listed by Windows but selecting it reverts to the default so that nothing is changed. Microsoft acknowledged the issue and added it to the list of known issues of KB4462919 released on October 9, 2018. After installing this update, some users cannot set Win32 program defaults for certain app and file type combinations using the Open with… command or Settings > Apps > Default apps. In some cases, Microsoft Notepad or other Win32 programs cannot be set as the default. The company notes that subsequent attempts to change file associations may work and that it is working on a fix for the issue that it hopes will be available in late November 2018. A PowerShell script has been created to address the issue. You can check out the script here (via Woody). The script makes bulk changes to file associations in the Windows Registry. It is highly recommended that you back up the Registry, create a System Restore point, or back up the entire system before running it on machines affected by the issue. The script removes all items under HKEY_CURRENT_USERSoftwareMicrosoftWindowsCurrentVersionExplorerFileExts.xxxUserChoice for file extensions and creates values under the OpenWithProgids and OpenWithList keys to fix it. Copy the entire script from the linked website. Paste the content in a new plain text document. Save the document as files.ps1. Open an elevated PowerShell prompt (Open Start, type powershell, right-click on the result and select run as administrator). Use .files.ps1 to run the script. Reset options are provided under Settings > Apps. 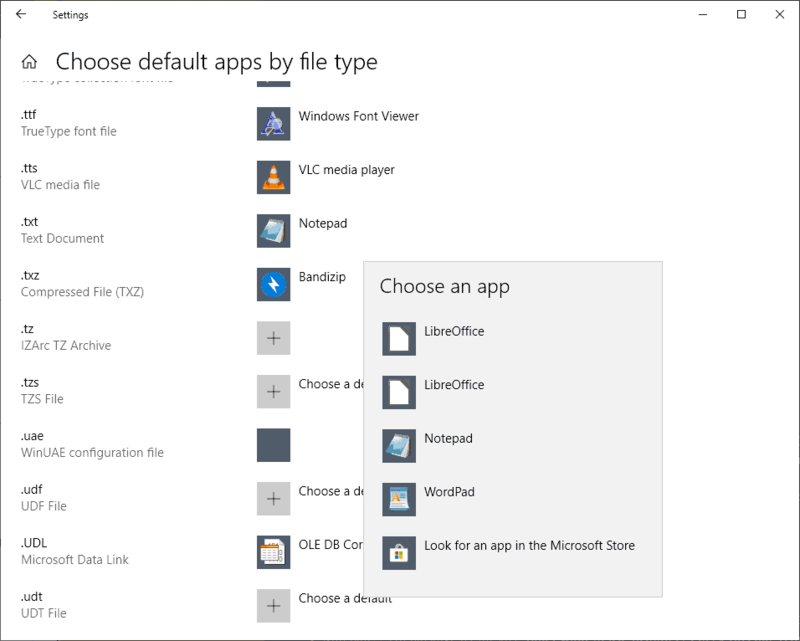 Unrelated but still puzzling: why is there no search on the “choose default apps by file type” page? Now You: Do you experience the issue right now on your system?